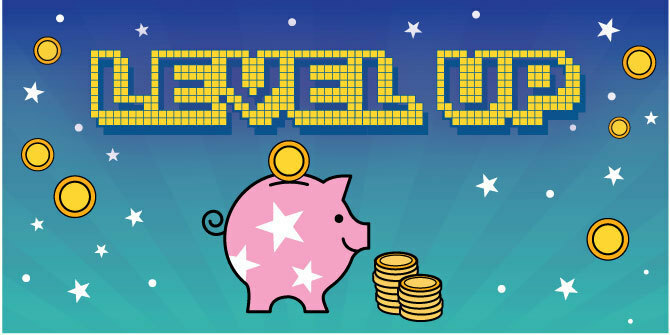 Level up to a 30-day kids’ money challenge! Help your children make saving fun and easy with the 30-day money challenge for kids! This first-person experience lets your children be the hero of their own savings game. Here’s how you and your children can have fun saving together. There are no hard-to-understand formulas, just simple savings with this money challenge. Starting with day one, your children save 25 cents. Day two they save 50 cents. Their deposits level up throughout the month, by adding one more quarter to each day’s beginning balance. So, the largest amount of money your children ever put into their piggy bank or jar at one time is $7.50. At the end of the month, they’ve saved $116.25! Plus, when they deposit their hard-earned coins into a Fat Cat Kids Account or Zard Teen Account, their money earns dividends on top of their savings, like your LGFCU Share Account does. That means your children are saving even more money for the things they want! April is Financial Literacy Month and a great time to help your young kids lev­el up their real-life savings skills with this 30-Day Kids’ Challenge activity page! They’ll have fun seeing how putting change in a jar each day adds up over 30 days. Help them set a goal of saving for something they really want. At the end of the month, they can use the Fat Cat Coin Sorter at their local branch to count their savings. Then they will be able to decide how much to put in their account versus how much they want to keep in cash. Plus, they’ll be excited to score that new vide­o game, ic­e cream outing with friends or something else they want­ to buy later! If you have teens at home, let them in on the action! Give your older players a mission to sock away money every day and see where they rank at the end of the month. This 30-Day Kids’ Money Saving Chart is a great way for your teens to see their savings compound. We’ll supply you with tips for earning money to put into savings, information on the value of saving and earning, as well as ideas for smart shopping, and more, all month. And 30 days isn’t the end game. For an even bigger challenge, help your children save all year with the 52-week savings challenge for kids. You, too, can get in the game this month by showing us how your children are saving! Connect with us on Facebook and share your children’s decorated coin jars for a chance to win a change counter for your little one, or show your teen gamer with a completed challenge sheet for a chance to win a $25 Visa® Gift Card. Check out our official rules.